Medical Injector from ​MI Medical Innovation, France. ​Precision PISTOR Eliance is equipped with an LED touch control panel for tactile management, enabling fast and easy programming and selection. The settings are highly precise ensuring exceptional reliability of delivery. 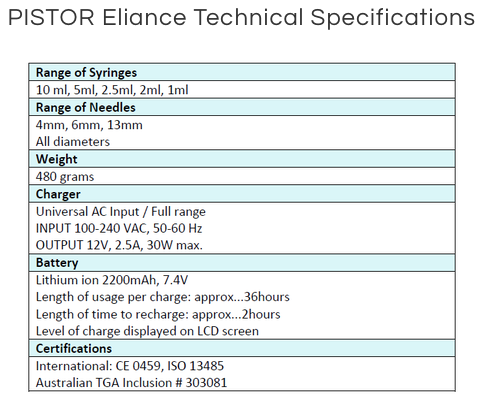 ​Power PISTOR Eliance incorporates the latest components, making it suitable for injecting high viscosity solutions such as Hyaluronic Acid. 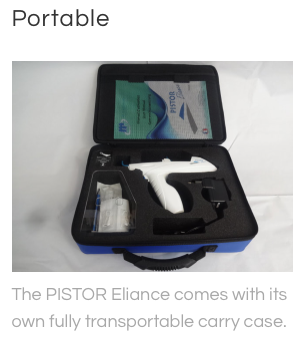 In gust mode, the PISTOR Eliance can deliver up to 300 injections per minute. ​Ergonomics Weighing only 480grams the PISTOR Eliance is light, comfortable and easy to use with either the left or right hand.